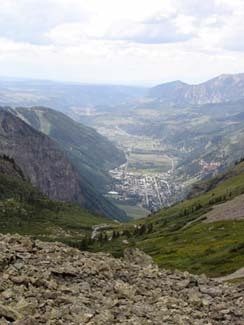 The Missing link Between Black Bear Pass & Imogene Pass is a historic mining road in Marshall Basin. Send your letter of support. After review, consideration, and additions from the Town of Norwood last week, the San Miguel County Commissioners (BOCC) unanimously approved a Norwood town board proposal to designate a number of county roads open to Off-Highway Vehicles (OHVs). Already, several county roads on Wright’s Mesa are open to OHVs, based on resolution 1994-1, approved in January 1994 by the BOCC, and amended in 2005. The newly-approved roads complete a route around the mesa, enabling OHV users to make a circle out Lone Cone Road (44ZS), up to and past Miramonte Reservoir, and down through Burn Canyon, across Naturita Canyon, and back to town via AA42 to 43Z.In July of 2009 the town of Norwood passed an ordinance to allow OHVs on Norwood streets, excluding Hwy. 145, as Colorado law does not permit OHVs to be operated on state highways. Other routes added last week include 42ZS to Y43 to 41.5Y, linking riders from town to Thunder Road, and County Road Z42 out past the Hardman’s elk ranch, and 43ZS, or Vet Road. All OHV operators must comply with legal requirements for operating OHVs on public roads, including h traffic laws and possession of a valid driver’s license, as well as safety requirements already set out for OHVs by the Colorado Board of Outdoor Parks and Recreation. Operators without a license must be under direct supervision of someone with a valid driver’s license, and children under the age of 10 are not allowed to operate OHVs on San Miguel County roads or portions of those roads. Maps of the newly-designated OHV routes will be available next week at the Town of Norwood office (327-4288), 1670 Naturita Street, and at the County Road and Bridge Department (327-4835), 1120 Summit Street, in Norwood. The town and San Miguel County will include route information on their Web sites (www.town.norwood.co.us, and www.sanmiguelcounty.org ), as well, in the coming weeks.